During the summer, West Yellowstone, Montana, serves as the main gateway to the western entrance to one of the county’s most popular national parks. With far fewer crowds, it’s sometimes easy to overlook that winter is an amazing time to visit West Yellowstone. A thick layer of powdery snow transforms the terrain around town into an intimate winter wonderland, and it’s easy to spend a day simply cuddled up next to a roaring fireplace, watching snow fall in the woods. But for those more adventure-inclined, wintertime in West Yellowstone delivers as well, with plenty of on-snow activities to enjoy. Yellowstone National Park is a completely different experience in the winter season. The busy roadways are transformed into snow-laden pathways trekked only occasionally by snowcoaches and snowmobiles. Forget the crowds and experience a uniquely profound look at Yellowstone. Guided tours, either by snowmobile or snowcoach, offer a new view of the nation’s first national park. The sight of Old Faithful erupting against a background of snow-laden pines—with bison meandering in the background—is a quintessential scene during the “quiet season” at the park. One of the most peaceful ways to explore West Yellowstone is on cross-country skies, and the town is home to a thriving community of skiers. Thanks to local outdoor stores such as Freeheel and Wheel, gear rentals are accessible and reasonable. The town is rightly proud of its Rendezvous Ski Trails, which features 35 kilometers of well-groomed trails that wind through stands of lodgepole pines and across open meadows. The gently rolling trails have something for every level of skier, and you’ll find races and festivals held here throughout the season. You can access the trails dotted throughout Yellowstone National park via snowcoach, while additional cross-country options closer to town are easily accessible by car. The Boundary Trail, at the end of Boundary Street on the northern edge of town, is groomed once or twice a week and welcomes dogs. 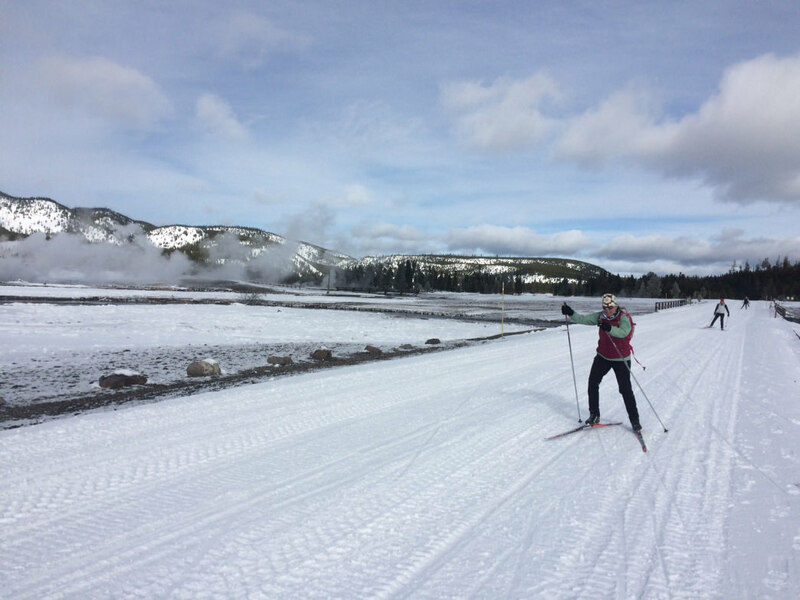 The Riverside Trail, also accessible off Boundary Street, enters Yellowstone National Park and is a favorite for skiers seeking glimpses of the area’s bountiful wildlife. 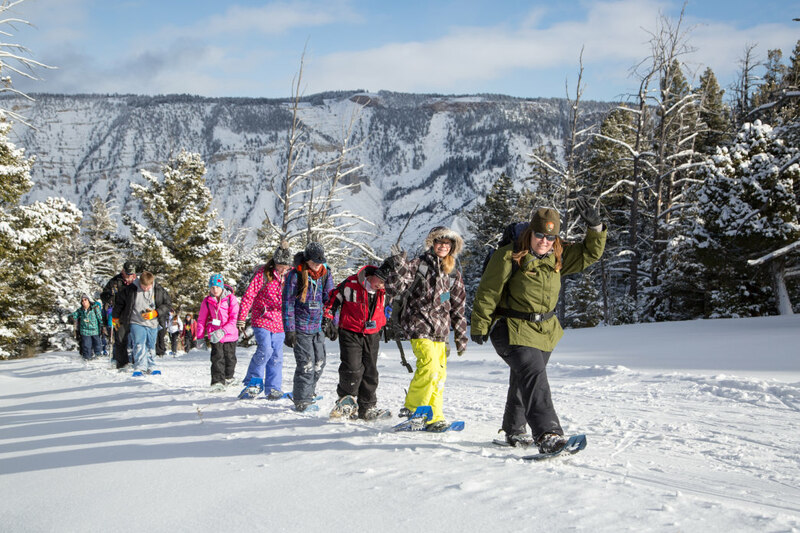 Snowshoeing slows the pace down even more, offering opportunities to soak in the landscape and keep an eagle eye open for elk, bison, and even wolves. Rentals are available at several shops in West Yellowstone, and thanks to the inherent ease of the sport—if you can walk, you can snowshoe—this wintertime sport is ideal for those who don’t want to learn a new skill but want to take advantage this unique way to explore the snow-covered terrain. While West Yellowstone is known around the world for its blue-ribbon fly fishing, the angling doesn’t stop in the winter. Nearby Hebgen Lake is a popular ice fishing destination—productive enough to be home to a North American Ice Fishing Circuit tournament in January. Shops are open throughout the winter and can offer friendly local advice on fishing conditions and equipment needed. For a bit more excitement, hop on a snowmobile. West Yellowstone has become a regional hub for snowmobiling, with close to a dozen different outfitters. The more than 400-mile trail system starts in town, where snowmobilers can share city streets, and expand outward into the Custer-Gallatin, Beaverhead-Deerlodge, and Caribou-Targhee National Forests. Take to the groomed trails for an easy ride, or hit the backcountry to access the pristine power meadows and alpine excitement. Guided tours are available for those looking to learn how to use the machines and learn more about the region on an unforgettable trip. 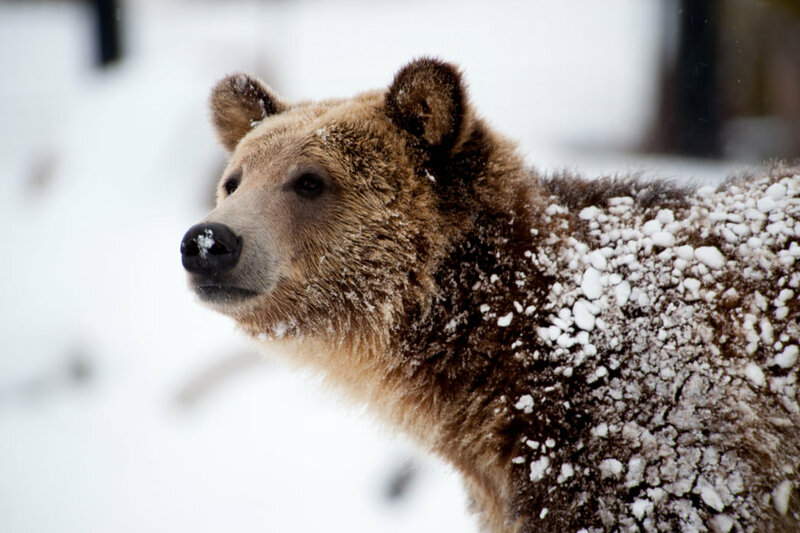 The Grizzly and Wolf Discovery Center, located on Canyon Street, is a local treasure, offering visitors the opportunities to see wolves and grizzly bears up-close in close to their natural habitat. The seven grizzlies all came to reside here were either nuisance bears or cubs of a nuisance bear. When bears obtain food from people, damage property, and act aggressively toward people, they are usually killed. The center rescues bears in this condition and provides them with a large outdoor habitat and a stimulating environment (and they don’t hibernate, so winter is still a great time to visit). The six wolves were born in captivity and unable to live in the wild, allowing visitors to see these secretive creatures up close in their natural environment. An array of kid-friendly activities keeps the little ones entertained, and informational presentations help educate about the region’s wildlife and history. Regardless of your wintertime adventures in West Yellowstone, common-sense rules apply, and winter travel requires a bit of preparation. As with any outdoor undertaking, brief someone outside your party about the day’s plans and what time you hope to return. Dress in warm layers—sweat comes surprisingly fast with physical effort, even in frigid temperatures—and it’s important to be able to shed layers and then add them back on once activity level slows. With a bit of preparation, your focus will be on the glorious Western landscape to explore. And thanks to a variety of in-town coffeehouses and restaurants, you won’t have any trouble refueling after a day in the snow. Winter may be the quieter time in West Yellowstone, but you’ll have lots of ways to keep busy.